Pros: Excellent Trust Accounting Custom Reporting, Case Life Tracking, Tickler System, At-A-Glance Main Screen, Party/Contact Tracking/Integration, Imaging, Online Service Capabilities, Document Merging, Easy to learn...I could go on. Cons: That my new firm doesn't have it yet. Overall: I have worked in the legal field for 16 years and spent 8 of them using one version or another of CMP. Each version gets better. I have also used Legal Files, TimeSlips and PCLaw. All are trash compared to CMP. The only reason I could see giving a good review to any of them is because the person doesn't know what they're missing. They are missing a lot. CMP is the best overall full coverage case management program. To choose the best feature would be difficult. Versatility with respect to different areas of law is key and they covered it. On the rare occasion that we wished that the program had an additional feature, they made it happen, just like that. Trust Accounting, Custom Reporting, Case Life Tracking, Tickler System, At-A-Glance Main Screen, Party/Contact Tracking/Integration, Imaging, Online Service Capabilities, Document Merging...I could go on, but they are all the best I have ever seen. Easy to learn is an understatement. I was able to gain detailed knowledge of program function with very little training in less than 6 months. Tech support is personal and helpful, but are seldom needed. I have been with my current firm for barely a year and I am already pushing for the switch. Recommendations to other buyers: Get it as soon as possible. It will pay for itself in productivity. Pros: This software is easy to use without sacrificing capabilities, and the customer support is phenomenal. 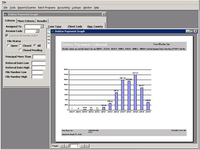 When I moved over to our firm's collections division a little over a year ago, I knew nothing about Casemaster - which is the software that our collections division has used for years. Within a matter of a few short weeks, I was using Casemaster consistently on a daily basis without issue. 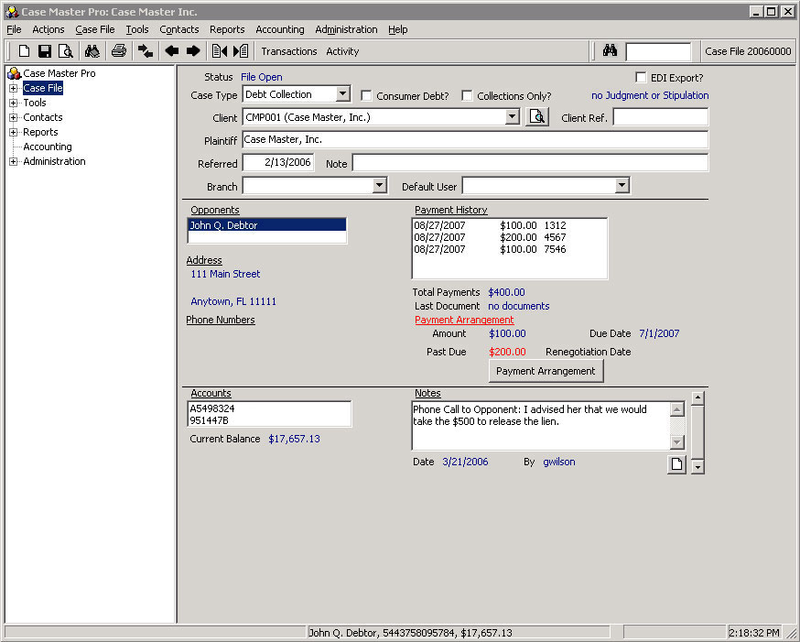 It is excellent for use in the collections industry, and our firm also uses this software for other purposes as well. Customer support is phenomenal - they always answer any questions we have in a timely manner, and are eager to help and provide suggestions and feedback. Highly recommend! Cons: A user's manual would be beneficial for reference - but all questions or issues are always thoroughly addressed in a timely manner. Pros: Besides offering every thing needed to run more efficiently, the ability to customize software to meet specific needs of the firm and amazing customer service. Cons: Wish we would've found out about this software sooner! 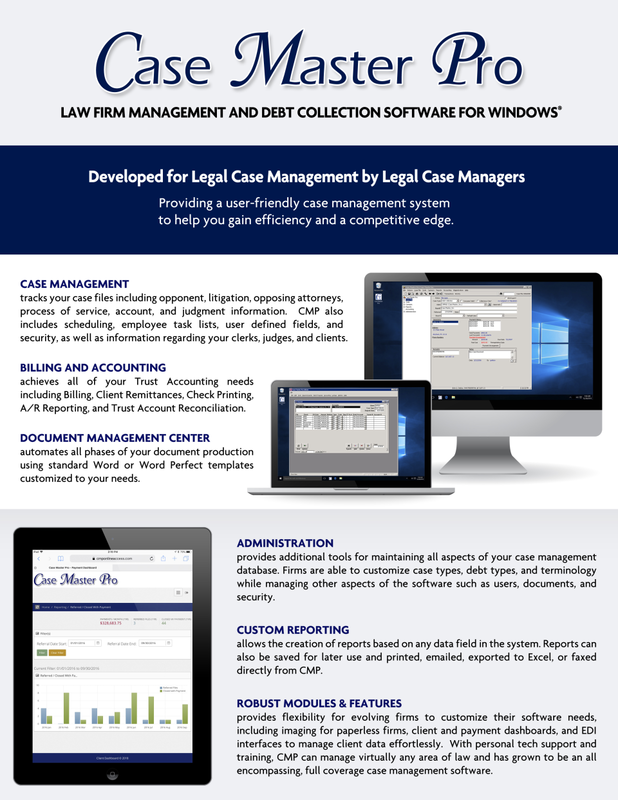 Overall: I've worked in the legal field for almost nine years and have been using Case Master Pro for the past six years. This software has been a blessing to our firm. 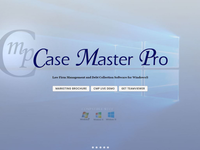 Case Master Pro has numerous case management abilities and has made our job SO much more efficient and better in many ways. Technical support is a phone call or email away, with quick response time. They are personal and extremely helpful with excellent knowledge of the system. They are also quick to adjust features to fit our firms need. I highly recommend Case Master Pro, you will not regret choosing this software. Thank you Case Master Pro for being so awesome! Recommendations to other buyers: Again, if you choose to use Case Master Pro you will not regret it. They go above and beyond to meet the needs of their clients and offer excellent technical support. Cons: All issues are addressed when a limitation comes to attention. 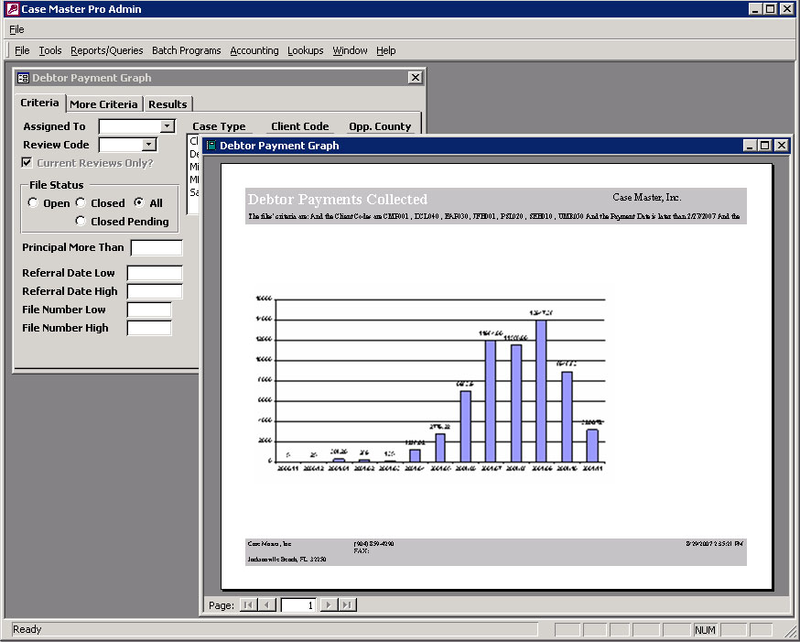 Overall: Case Master Pro software provides a seamless ability to maintain and document a portfolio for multiple users. The platform is extremely user friendly compared to other programs in the collection industry. 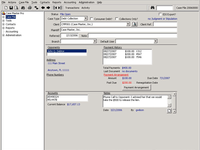 The software is not limited to collection portfolios and can handle a variety of purposes. 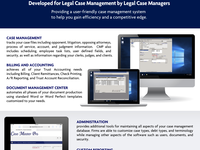 Our firm has enjoyed a long term relationship with Case Master Pro. Additionally, customer support has always been rapid and efficient. We look forward to many years to come. Recommendations to other buyers: Highly recommended in the collection industry. Pros: CMP has excellent file management and case tracking features to fit the needs of your office. The team can and will happily customize the program as needed. The software has the ability to maintain and track multiple accounts from general information, accounting, document merging, file retrieval, imaging and so much more. This is why, as a Post Judgment Collections Manager, I back this software. 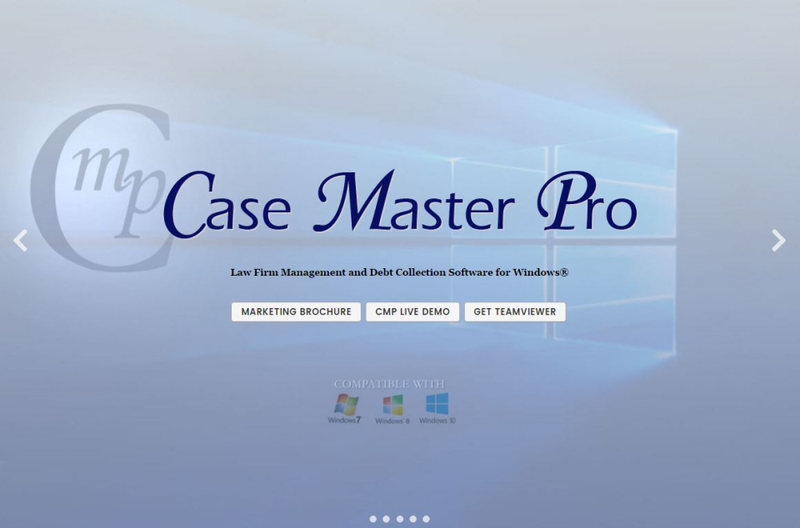 Pros: I have been working for a law firm for 22 years and I have been using Case Master Pro or CMP as we call it, daily. It offers everything that is needed to make my work load less stressful. When there is an issue, I will send an email and the problem is solved. Overall: We purchased this software six years ago and Case Master Pro has continued to exceed our expectations. I would recommend this product because it has the ability to manage all aspects of your files. Further, I would recommend Case Master Pro because of the exceptional customer service provided.